After the Dissolution of the Monasteries by Henry VIII, Vauxhall Manor was transferred to Dean and Chapter of Christ Church, Canterbury. In 1575 Peter Palmer had a lease from the Dean on two closes called Claylands. By 1590 a Lawrence Palmer was the leaseholder of Claylands and several other plots of land in the Vauxhall area. In 1767 Sir Joseph Mawbey (Senior) took out leases on the plots that Lawrence Palmer had leased, but Mawbey died in 1798 and in 1800 his property was put up for auction to pay off his debts. In 1801 The Dean and Chapter sold off one part of Claylands to John Daniels of The Lawn and the other part to John Fentiman (Senior). Fentiman, at his own expense, drained the very marshy Claylands and built a ‘handsome mansion’ at the end of present-day Claylands Road. It is not known when Claylands Road was laid out but by 1836 Fentiman had granted a lease on a plot of land on the north side of Claylands Road for the erection of a Congregational Chapel. 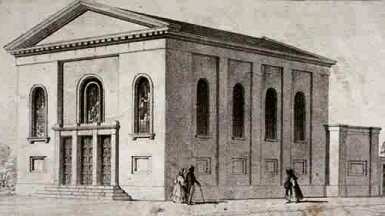 The foundation stone of the Chapel was laid on 1st January 1836 and it was opened on 29 June 1836. Built using plain stock brick with a classical pedimented front, it has three entrance doors divided by stucco pilasters with cornice and blocking course above. All the windows are round arched with recessed rectangular panels beneath. The architect is not known but may have been D. R. Roper, the architect of St Mark’s, Kennington. It is said that inside there was a gallery at one end and the building had some William Morris decoration. The Sunday School at the rear of the Chapel was built in 1899 to the design of W E Davis.